Here is another recipe that was on my "to try" list of super bowl appetizers. 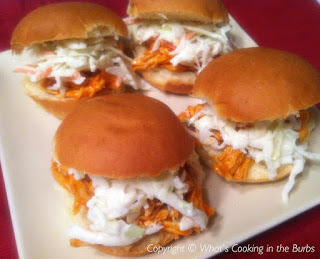 I love buffalo chicken sandwiches so I knew these were going to be good! The creamy ranch coleslaw was the perfect accompaniment for this tasty little sandwich. Great for portion control too! They were a hit! Place Chicken in the slow cooker along with 1/4 cup water. Sprinkle brown sugar on top of the chicken. Cover and cook on low for 4-6 hours. Remove chicken and shred. Return to slow cooker and add your two sauces. Serve each slider topped with some of the chicken mixture and some of the slaw. Enjoy! Place coleslaw mix and carrots together in a large bowl. In a small bowl, blend together the ranch dressing, mayo, sugar, and lemon juice. Add to the coleslaw and toss to coat. These look so yummy, Bridget! Great party food! Thanks for the invite. I'll be sure to stop by and link up! These look delicious Bridget - just pinned! Oooooh yum! I love buffalo chicken anything... these sound amazing! Oh I want this for dinner! I love Buffalo anything! Hi I found you on the Blog hop. Now following you. Please stop by and say hi when you get a minute. have a great week. :) Please check out my new Weekly Goals Blog hop. You can find it here. http://lenettacarnes.blogspot.com/2013/01/weekly-goals-linkup.html#more Would love it if you would link up with me. This looks yummy--I do love Franks! Can't wait to try this recipe. I envision eating these at my Super Bowl party! Found you on Thursday's Treasures - yum! Yum! These look so good I want them right now! This has been known to make my hubs go weak at the knees!! We are team Blue Cheese, though. Nonetheless, these are always a treat! Stopping in from #GetHimFed. Have a great day!